When I was eleven years old, I convinced my mom to drive me to Blockbuster store and, despite it costing far more than my meager allowance, rent a brand new Nintendo Virtual Boy with two games: Mario Tennis and Mario Clash. As I took it out of the giant padded plastic case and set it up on our dining room table, I couldn't help but think I was touching the future. Soon all games would be played on VR headsets! We would be able to enter worlds totally different from our own and it would all seem real. By the time I was done with the Virtual Boy two hours later, all I had was this odd tint to my vision and a stiff neck. Don't get me wrong: I still thought it was cool, but it was far from what I had dreamed of. Since that time, I have been convinced that the dream I saw in early 90s cartoons of VR helmets putting you into a VR world were completely unrealistic—something that would never be done via a bulky head piece like we all imagined. Oh sure, I had tried headsets that simulate a 60-inch HD television and even tried out Sony's 3D headset back at TGS last year. And while they work, they still fell short of my childhood dream. So even though I, like many of you, had been hearing great things about the Oculus Rift headset over the past year, I wasn't really expecting anything special. I thought it would just be another headset that made it look like you were staring at a big 3D TV. This past weekend, I got to see how wrong I was. The first thing I noticed when putting on Oculus Rift is how it took up almost all of my peripheral vision. It in no way feels as if you are looking at a screen. The first game I played was a helicopter demo called Heli-Hell2. Just a simple tech demo, the most interesting thing about it was that if I turned around, I was able to see a passenger lurking silently behind me. The next game I was able to play was Proton Pulse Rift—basically Arkanoid—where my head movement controlled the paddle. The hardest thing about it was teaching myself that, unlike with Kinect, leaning my head left and right did nothing—only turning my head moved the paddle. But after a few minutes with that, it was time for the big guns and we booted up Portal 2. At this point, even though I had already played two games with amazingly well done 3D, I still expected Portal 2 to be 2D—but like I was playing it on an IMAX or something. After all, Portal 2 was never designed to be rendered in 3D. But from the moment I put the headset back on, I could see how wrong I was. Everything was in 3D. It really looked like I was there, in the testing room. The only thing that looked weird were the vine textures on the wall as they clearly had no depth and thus looked like wall paper. Everything else, though, looked amazing—despite the fact that I was able to see the pixel boxes if I looked closely. I began playing right upon exiting Chell's room from the first game. At first it was more than a little disorienting. Oculus Rift really messes with your sense of place. My eyes were telling me I was standing in an open room, not sitting in a chair in a small bedroom. When I moved my head, I could look around—which I did a lot. But any time I was moving, I found myself using the right thumbstick instead. Just looking around upon entering each room was rather amazing, especially as the ceilings got higher and higher. The first time I had to fall down into a pit, into a portal and then get launched across the room was a truly exhilarating experience. I even found myself laughing with sheer delight. 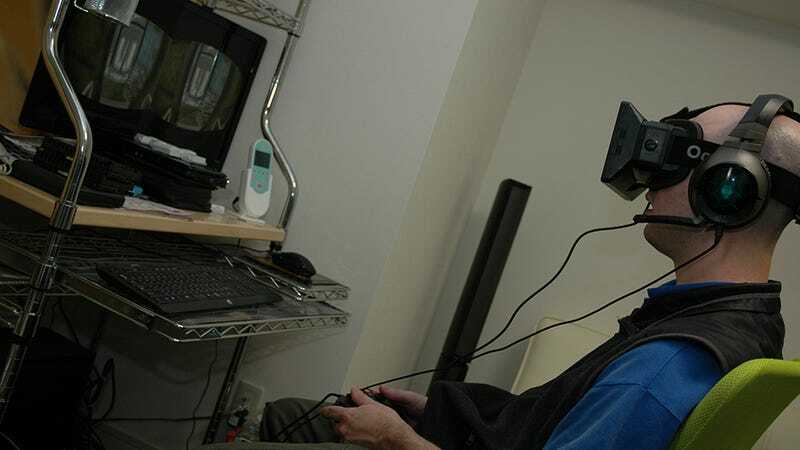 Trapping myself in an infinite loop was also a highlight of playing Portal 2 with Oculus Rift. In the end, I probably played Portal 2 for 30 minutes. By the time I was finished, I had gotten quite used to it—though hardly any of the novelty had worn off. Taking off the headset, the whole world seemed to shrink; the tall ceilings were gone and I was back in the tiny Japanese bedroom room. Honestly, as a game fan, it made me want to buy a developer kit on the spot to play with on my own—though I am trying to hold out for the final product. From my short time with it, it really seemed to deliver on what VR headsets were supposed to be like as I dreamed them in my youth. Moreover, other than the slight feeling of disorientation when I first put it on, there were no side effects—no headaches or the like. Oh and one last note for any glasses wearers like myself out there. While it was a bit of a tight fit, I had no issues enjoying Oculus Rift while wearing my glasses. Frankly, now I cannot wait for the final release of Oculus Rift. And already I'm planning for my next experience with the system. Do I play something deep like Dear Ester or go for broke and play Bioshock Infinite? Decisions, decisions.